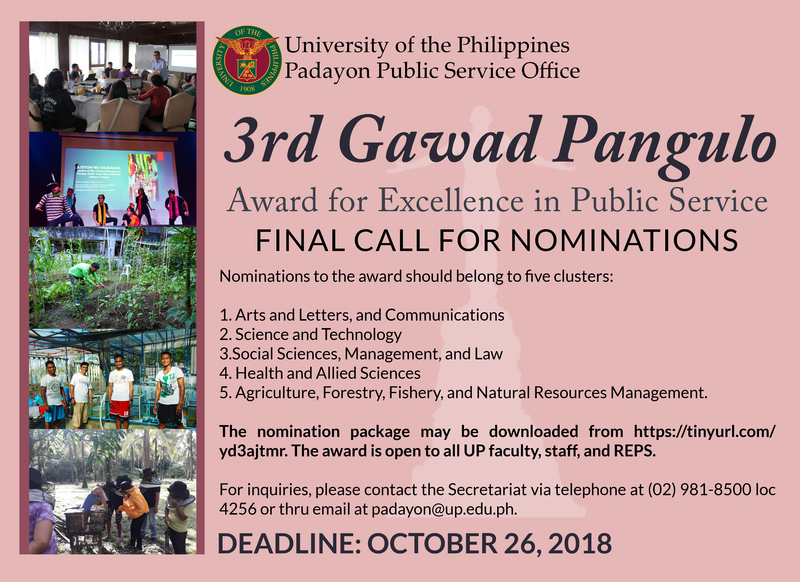 The call for nominations to the 3rd Gawad Pangulo: Award for Excellence in Public Service has been extended to October 26, 2018. The award continues to give due recognition to exemplary public service initiatives across the UP System that exhibit compassion in delivering programs and services to the different publics that the University serves. Nominations should belong to five clusters: Arts and Letters, and Communications; Science and Technology; Social Sciences, Management, and Law; Health and Allied Sciences; and Agriculture, Forestry, Fishery, and Natural Resources Management. Eight awardees will receive a prize money worth PhP100,000.00. The nominations must be emailed to [email protected] on or before October 26, 2018 and must include a documentation of the project, a list of academic and/or official citations, certification from program beneficiaries, and certification of proper liquidation of funds (if government-funded). The nomination package may be downloaded from https://tinyurl.com/yd3ajtmr. Physical copies of the nomination package may also be sent to the address below. Packages must be dated on or before the deadline. 2/F, Rm. 208, Vidal Tan Hall, ITDC Bldg. Quirino Ave., cor. Velasquez St.